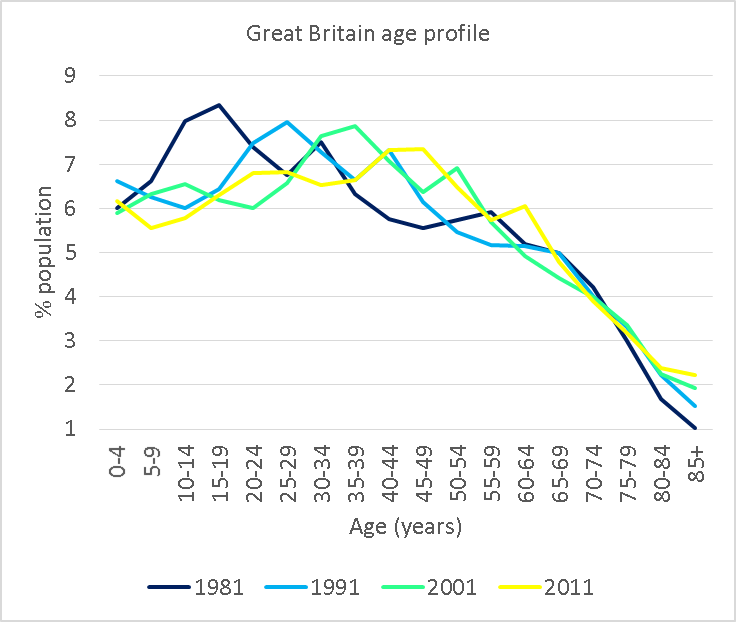 These modelled estimates show the slowly rising national average age in the last 30 years. The continuing projected increase in our elderly population, will bring bigger demands in health and social care, financial planning, housing and transport. How prepared are we to serve the needs of our ageing population or is this trend a demographic time-bomb? Like most national demographics, local variation can be observed where we may focus planning and resources effectively. Our coastal and rural areas historically house older resident communities on average.This partly reflects the ability of the retired to move to areas without a strong employment economy, the pull for younger workers to the cities, and the influx of migrants of working age to cities. A slow rise of the average resident age occurred in similar geographic areas between 1981 and 1991. By 2001 there was a marked change in the settlement patterns of central London and its hinterlands. 30 years ago these central areas were comparatively older than edge-of-centre suburbs, at which point this pattern reversed. The latest census showed how pronounced these trends have become nationally and regionally, however sub-city level patterns often reveal the relatively static nature of neighbourhoods over time. A Geofutures Mapcase Delivered by Geofutures Ltd.